This entry was posted in Home-Made Pastas, Make It Yourself, Misc, Pasta/Rice/Soups (Primi Piatti) and tagged Food, Italian, Pasta, Recipes by ChgoJohn. Bookmark the permalink. Mouth is watering… mushroom with cheese is always a wonderful idea 🙂 Just baked a similar crusted salmon today, too, but the crust was so dry (well, I had to substitute with panko). Can’t wait to see your recipe and try it out! Thank you. For so few ingredients, this filling really does deliver some good flavor and the pasta can stand up to pretty much any kind of sauce. Sorry your salmon didn’t turn out as well as you had wanted. This breading is one that my family uses on everything. I hope you’ll like it. I love this filling! It’s so easy and simple to prepare. For an pasta the simple preparations are my favourite. I like to taste the pasta and not have it too overpowered by fillings or sauces. This is perfect for me. Enjoy your trip to Michigan, John and pity me as I will be suffering a move. My aunt lives in Grand Blanc and she keeps posting such pretty pictures of spring time so at least it’s beautiful there right now. Have a good trip! Thank you, Nazneen, for your kind words. I don’t envy you the move, especially having so little time to prepare for it. On the plus side, it will be over before you know it. I hope you have some help. Dear John: thank you for posting at such convenient times for us Down Under 🙂 ! Hope you have a wonderful Memorial Day Weekend: a visit with Zia and friends methinks 😀 ! The filling is great and you give variations to suit everyone! Well, I always have leeks and goat’s cheese, porcini may have to be partly or wholly replaced by other kinds! Childishly: yummy!!! Looking forwards to the baked haddock when you return: meanwhile do hope that all the tragic events SW and the path of the storms possible do not impact on your journey . . . all the best . . . Thank you, Eha, for always leaving such kind comments. I was unsure whether dried porcini would be available to everyone. I cannot find fresh porcini but dried are readily available to me. You can easily substitute other mushrooms if need be. Shall miss the name in the letterbox but am so glad for you 😀 ! Once again, deliciousness! Thanks for this great recipe with porcini and goat cheese, that sounds like the best filling in my book. Have a relaxing time away. Thanks, Angeline, for the compliment and well wishes. See you in 2 weeks! Oh wow, that looks sensational John! Can I come over for dinner? 😉 Great post! Chris (my husband) is on his way back from Michigan tonight. You have yourself a safe trip! Don John this it looks delicious,i really like your variants too,very delicate dish, Will be lovely to enjoy with a great Villa Antinori,thank you for sharing!!! Lovely post, John, packed with things that i like. I’ve just made a similar looking baked fish, I’m mad for the grilled gamberetti and me and the wonton wrappers are going to get together. Have a good time in Michigan. Thanks, Roger. I’m sure I will. I hope you do try and enjoy these dishes. Zia would be thrilled. Every meal in your home is a celebration of food John – fabulous! Have a safe and wonderful trip to Michigan! That’s such a nice thing to say, Mandy. Thank you. I’m in the middle of packing up the animals’ “stuff”. By the time I’m through, I’ll be lucky to fit a single bag of my clothes. Have a good week! I love leeks, but don’t use them often enough! And I love any filling that uses goat cheese! I am so excited to be able whip up ravioli with wonton wrappers! Thanks for the recipes John! You’re welcome, Tanya. 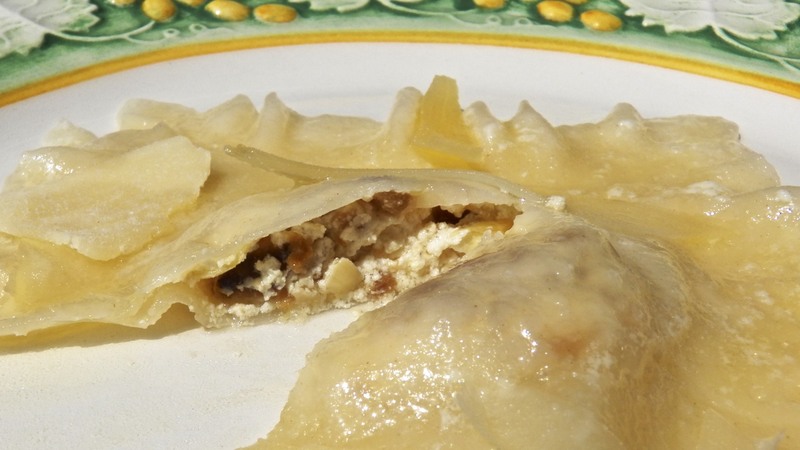 These 2 posts were all about making homemade ravioli more accessible. I hope you do give them a try. Good luck! John, have a wonderful with your beloved Zia! How did you know I recently bought 500g of dried porcini….. 20g is just a drop in the bucket so to speak. There will be so many mushroom dishes this winter. Thanks, you, Elaine, I certainly will. 500g of dried porcini?!?! I’ve never seen a package that large. The largest I’ve seen is a pathetic 28 g. What fun you’re going to have during Winter! What a time we’d have! I wish we had film of Mom & Zia making pasta and ravioli back in the day. They got the job done but joked and laughed the entire time. That’s how cooking should be. I love goats cheese and mushrooms and you’ve made this filling even more elegant by using porcini mushrooms and leeks, bravo! I always strain my mushroom ‘stock’ through an unbleached coffee filter to make sure the sediments don’t transfer over. You can also buy a metal coffee filter to do this, but don’t use your regular coffee filter as it will transfer the coffee flavour to the mushroom ‘stock’. 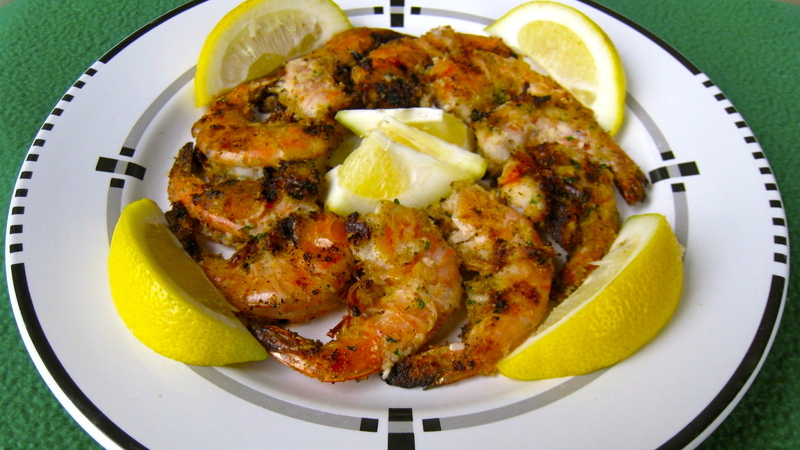 The melted butter and garlic are a lovely combo for the garnish sauce. Hope you have a lovely time in Michigan — I had no idea dial-up still existed. Not to worry. Use spring or sweet onion. Use less if the onion is strong. Easy peasy! Simple, delicious plus you make it sounds easy and do-able with all the variations. 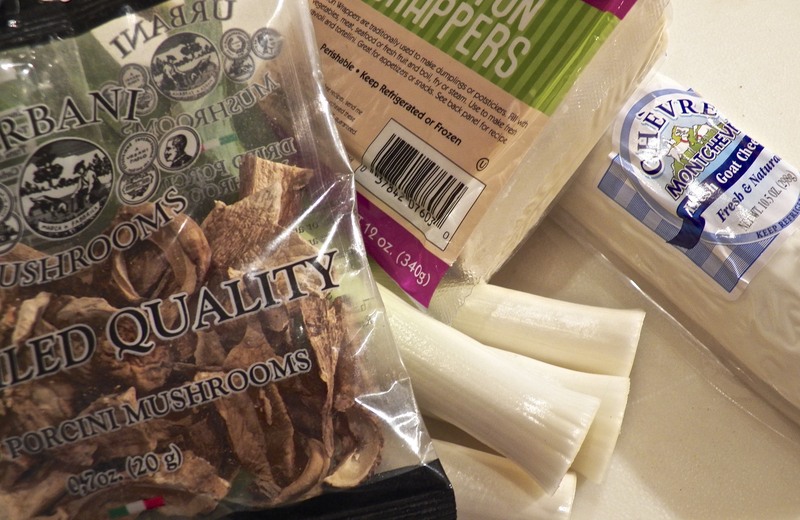 Another mushroom substitute could be dried Chinese (shiitake) mushrooms. Have a safe and wonderful trip. Say “Hello” Zia. And you’re right. Shiitake mushrooms could easily work here. Thank you, Richard. Easy and tasty. You can’t beat that! Thank you so much, Betsy, for all the well-wishes. We — that’s Max, Lucy, & I — will be getting an early start, trying to get ahead of rush hour traffic. My husband and I were fortunate to be the test crew for this dish and we endorse it without reservation! Delicious! Buona notte, BAM! Believe me, if I could ship pasta to Hong Kong, I’d do it for you! Your comment about the sting and dixie cup gave me a laugh. We’ve joked for years about the same thing, only tin cans were used instead of the cups. I’ll have a great time with Zia and Max will get all the treats he could possibly want. A good time will be had by all. 🙂 Thanks, BAM. Nice, easy filling! I love using mushrooms in pasta fillings. I’m having some vegetarian friends for dinner this weekend and am planning to make ravioli (the traditional method, not the wonton shortcut) and may use this filling, or parts of it – I know I want to do something with mushrooms! Really great looking recipe – thanks so much. Oh, and I forgot to mention that I hope you have a terrific trip and wonderful long weekend! I really wanted to keep this one simple, John, and hope that by doing so I could entice a few more people to try making ravioli at home. It only takes one time and I know I’ll have ’em hooked. Thanks for commenting and good luck with the dinner. And what a great combination of filling flavors. I’ll let you know as soon as I make this, and it is on my “saved” list! Thanks and I’m glad you’ll give ’em a try. I hope you like the filling as much as we all did. I sent the link to this recipe to my pasta-making husband and hope he gets the hint. Making room for some “dial-up time” is important — enjoy! Simply delicious! I’ll give this a go…. I have the porcinis and the leek at home right now! On my lunch hour I will get the goat cheese and the won ton wrappers! This is dinner tonight! I have been so eager to get this recipe. I really can imagine the taste, and that’s going to drive me a little crazy all day! 🙂 Should someone get this excited about a ravioli? Well, I am! I’m so glad that you’re going to try this. Heck! I’m excited for you! Good luck! That haddock looks exceedingly promising. Seems to me like it’d fit beautifully indeed with the leek-and-cheese filling! Commence salivating now! Oh you have got a winner with this recipe John! How in the world do you come up with so many great ideas & make them sound so easy to put together? I really wish that I lived next door so I could offer to taste test all of these creations. Alas, my best cooking buddy across the street is selling her house so I’m not going to have anyone to play with in the kitchen. I’d say widening the doors makes sense – you know just from a safety standpoint of course. Simple is best, especially with these flavours, and this filling sounds delicious. Enjoy your trip to Michigan! So simple, and it sounds phenomenal! It’s really great that you suggest substitutions, too. We will miss you next week! Thanks, Suzan. I’ll be back before you know it. Have a great weekend & holiday! I’m leaving right now to go get my ingredients. I will let you know how it turns out. 🙂 Have a wonderful visit…and enjoy being unplugged! Good luck and I can’t wait to hear how things went. Nice filling, but I REALLY can’t wait for that haddock! Thanks, Greg. That means a lot coming from you. OMG You had me at porcini. Safe travels, hope the kitchen is open in Michigan 🙂 I fear dial-up. Just unplug and be free. I love this. I think I’ll try a burnt butter and sage sauce and leave everything else the same. Perfect! I so agree, Maureen. I wanted this to be simple both in preparation and when being cooked but all the while I was thinking brown butter and sage. I’ve an asparagus-based stuffing recipe coming up that will be dressed with that combination. As you know, it’s just a wee bit more difficult than the plain melted butter that I used to dress today’s ravioli. You’re such a well organized host. I usually invite guests over to be experimented on (although I am type A enough to have a plan B in the background) 🙂 These look yummy as usual. Hope you have a wonderful time in MI, hopefully the forecast will include some sunny days. Will miss your posts and charming stories. The filling sounds delicious and I am wondering how it would taste spread on a fancy cracker? You know I am not going to make your amazing ravioli anytime soon but that combination of flavors sounds so good. Have a wonderful Michigan weekend. Will miss you and your witty comments. Know you will be doing some wild cooking with your family. Can’t wait to hear all about it. You want to spread it on crackers, another wants to spread it over a grilled steak. I say “Yes!” to both, although my vote is for ravioli. Big surprise, eh? Thanks for the well wishes, Ruth. I’m looking forward to this trip and have some goodies to spring on Zia. We’ll be cooking up a storm! Yum, simple, fancy, healthy–what’s not to like here? Nothing, that’s what 🙂 Have a great 3-day weekend and beyond. Are you like the man of my dreams? I love this filling. And I finally found a burrata in Phoenix when I was taking care of my mom. i ate half of it before I put it on her salad. Yummy! Will miss you! Have fun in Michigan. I know what you mean about burrata. I had to control myself because mine was going to be photographed for the blog. Once the last picture was taken, however, that poor cheese didn’t stand a chance. I’m glad you like today’s recipe and thanks for you kind words. I’ll be back before you know it! ciao! just the best flavours…and yet you offer so many variations that are just as delicious. Very nice John. Enjoy the trip. Thanks, Conor, on both accounts. Filling and comforting! My son loves anything pasta….he will be jumping with joy with these! Have a great day! Hope you’ve had a great couple weeks! Oh yes! I will be making these real soon! You always blow me away with your beautiful dishes John! Have a great time in Michigan! Thank you, Lidia, you’re so kind. I had a wonderful time with Zia and there’ll be a post about it soon. Genius! I must have missed last weeks post, so I’m pleased to be catching up – and the genius part is that I bought won ton wrappers a while ago, shoved them in the freezer thinking I’ll do something with those, and actually not knowing what. Thanks, Claire, I had a wonderful visit. Just LOOK at this fabulous filling! Mmmm! Thanks for suggesting variations. I’m a big one for always using variations. Another great post!! My file box has a lot of variety now.Can’t wait for the haddock one. Thanks, Celia, I had a wonderful visit back home. You’re so talented in the kitchen that making these pastas will not be at all difficult for you. You’ll be a ravioli making pro in no time. Guaranteed! Such a perfect combination of ingredients! I’m really very happy with everything in this filling my friend. Simple simple and good good. Thanks, Jed, and yes, dial-up is alive and still not well in rural Michigan. It isn’t so strange when you consider that they got running water just 10 years ago and caller ID about 4 years ago. Going home is as close to time travel as I’ll ever get. I enter my car, in Chicago, in 2013 and exit it, in Michigan, in 1995.
btw, how much did u paid for the porcini??? Thanks, Dedy. The dried mushrooms were about $4.00 for the package. I’ve just learned of a store selling fresh porcini and I’d like to go to see what they’ve got. I’ll let you know if I do and their price. What a great recipe John! the filling is so classy! I amtrying to come up with a ravioli recipe and your post just has given me that inspiration I needed! Bravo! Thank you so much, Ambrosiana. I’m honored that something I wrote could inspire such a fine cook as yourself. I hope you’ll share with us your filling recipe. I cannot wait! The weather wasn’t all that great in Michigan but, given the weather in OK and MO, we’ve nothing to complain about. I hope the weather settles down a bit for us all. Love this, John! I’ve never combined leeks and porcini yet, but it’s a great combination and now that you’ve pointed it out to me I certainly will. When I make ravioli with dried porcini stuffing, I use the soaking water to make a sauce for the ravioli. Hope you’re having a great time with Zia! Can’t believe dial up still exists by the way — here it’s been discontinued for some years now. Great filling recipes, John! You really want me to make fresh pasta. 😉 I wish you a wonderful trip. Hope you have a great time. Thank you, Francesca. We had a wonderful time together. I bet you make a fantastic dish of pasta! You could definitely teach me a few things. Hey – I was missing you… and now I see that I missed your latest post… don’t know how I did that. As always – this looks amazing! And – I gotta tell ya – when I click “notify me of follow-up comments” – I get tons and tons. I think you have to be one of the most popular bloggers !! That’s ’cause you’re recipes, photos and videos etc. are excellent !! And your personality shines through it all !! 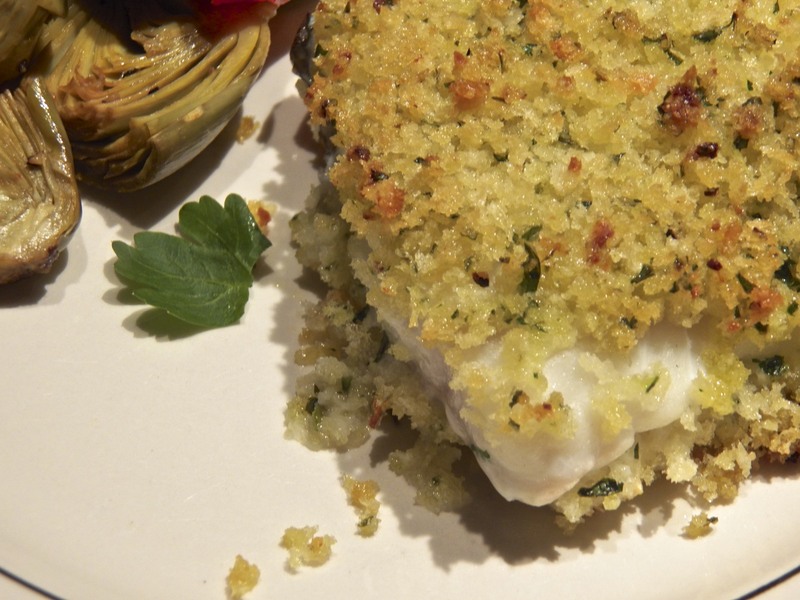 I’m jumping the gun, but just have to tell you, CJ, that the baked haddock looks wonderful. Can’t wait to see it when you return. Meantime, thank you so much for the simple filling recipe that I hope to use in wonton wrappers. Exactly! It is achievable, Laura. I’m certainly not gifted or handy in the kitchen. In fact, I’m pretty much all thumbs — and yet I can make these. Surely you can. All you need do is give it a try and you’ll see. And this filling is simple enough to be the first one to make. You really can do this, Laura. I love it that you keep everything simple and straightforward and the you give many variations to suit many different palates or to substitute when something is not readily available. I don’t know when but I’m going to make this, Time to learn some pasta filling skills. Thanks for sharing and for keeping everything simple. Have a lovely week, enjoy Michigan. Ever heard the Michigan advert?…Michigan.org..very interesting and captivating. It’s on Canadian media all the time! Thank you so much, Liz. This post, and last week’s, were intended to show just how easy it is to make ravioli. There are no hidden steps. Everything is just as I wrote. Once you try it, yo’ll be amazed. Whoa!! I LOVE the combination of flavors here. I know I’ll be making this a LOT. Thank you, John, I really appreciate this series of pasta/ravioli posts. You are amazing! I feel for you, Susie. I’ve never gone anywhere near as long as you have with everything packed up. I give you a world of credit. As you saw in the slideshows, you don’t need much equipment to make these ravioli. And whatever ravioli isn’t cooked for that night’s dinner, can be frozen for another night’s dinner — hopefully in your new home. Michigan, with its seemingly endless shoreline, is really quite a gem of a state. I camped all over the lower peninsula and was never disappointed. I had a very nice visit with Zia. We cooked up some great meals together and they’ll form the basis for a few upcoming posts. I cannot wait to read more of your trip to Italy. I’m sure you had a wonderful time. I couldn’t think of a better sounding and looking filling for ravioli than this one. Totally scrumptious, earthy and comforting John. Have a nice break and enjoy Michigan and unplugging. Yes, I had a wonderful visit with Zia and going off the grid for a spell was a great way to recharge. Besides, with all of the cooking we did together, there was little time for anything else. Wow, what an amazing pasta filling! I’ve recently been introduced to porcini mushrooms… can’t wait to add them to pasta! Thanks for the tip! You’re very welcome, Amber. Porcini are great and they’re in season around here now. They’re good dried, too, and are excellent in risotto. Thanks for dropping by. We successfully made these this weekend John. I don’t know what to say. I’m speechless. And full (had some leftovers for lunch). These may be my most favorite things I’ve made from your blog yet. Not kidding, they are PERFECT. Thank you for the instructions, and that glorious recipe John. I really am speechless here! Thank you so much, Sarah, for the glowing review. I really get a kick hearing that you’ve tried and enjoyed these ravioli, as well as any of the other recipes you’ve tried. You’re always so encouraging and I appreciate your feedback very much. I think we should just “clone” John – then send the many Johns to our various homes !! I feel that YOU should get the frequent flyer miles… but the clones might not agree! !